Cheerleaders' Back Pain and Other Sports Injuries | Podiatry Associates, P.C. Even cheerleaders who are at the top of their game and at peak physical fitness experience injuries. They frequently suffer injuries to their lower back due to poor conditioning. Too often, flexibility and repeated routine practice are given precedence over building a strong foundation of core strength. Extreme lower back flexibility in a backwards motion (hyperextending) without a strong core can lead to lower back pain, and potentially a more serious condition called spondylolisthesis. 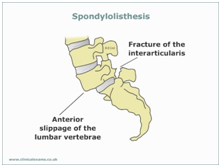 Spondylolisthesis is anterior slippage of one vertebrae upon another. This typically develops in adolescent children between the ages of 6 and 16, and thus competitive adolescent cheerleaders are a prime target. It can develop from genetics (weak bones) or from overuse (such as cheerleading). 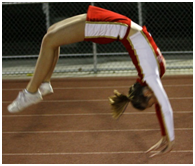 A cheerleader who performs repetitive backwards bending motions (such as a back hand spring), may be more likely to fracture their vertebrae due to repetitive trauma. This fracture creates instability in that lumbar vertebrae, and can eventually lead to anterior slippage of that vertebrae, or spondylolisthesis. Core Strengthening: Your transverse abdominis (the deepest of your four abdominal muscles) acts as a natural back brace to your body. It is the most important abdominal muscle to keep strong. To correctly fire this muscle, it is imperative you avoid all crunching movements, because a more superficial abdominal muscle, your rectus abdominis, will take over. Instead, you will need to lay on a flat surface with your knees bent, and slowly pull your belly button towards the surface you are lying on, attempting to assume a completely flat back. Hold this contraction for 5 seconds, and repeat for 10-20 repetitions. Progressions of this exercise can incorporate leg marching, leg bicycling in the air, and planks. However, you should not progress to the next level of transverse abdominis strengthening, unless you are able to keep your back completely flat, and avoid ALL lower back arching. Hip Flexor Stretching: Kneeling in a lunge position, activate your transverse abdominis, and attempt to get your back completely flat. You should feel a stretch in your groin on the leg that is behind you. Hold this stretch for at least 30 seconds, and repeat at least one more time. Quadriceps Stretching: While standing, pull your right heel up to your bottom with your right hand, activate your transverse abdominis, and make sure to avoid ALL lower back arching. You should feel a stretch in the front of your right thigh. Hold for 30 seconds, two times. Then repeat on the left leg. Lower Back Stretching: On your hands and knees, walk your hands out in front of you, then rock your bottom back towards your heels. Make sure you are not shifting side to side as you rock back. You should feel a stretch in your lower back. Hold for 30 seconds, two to three times. Mid Back Stretching: On your hands and knees, arch your back up to the ceiling like an angry cat. You should feel a stretch in your mid back. Hold for 15 seconds, two to three times. Postural Alignment: try to avoid excessive lower back arching in all activities throughout the day. Instead, opt to promote a neutral spine by incorporating transverse abdominis activation with all your activities of daily living. If you are a cheerleader suffering from lower back pain, and potentially spondylolisthesis, try doing the exercises listed above. If you don’t feel improvement in one week, seek the help of a professional. At Castle Pines Physical Therapy and Cherry Creek Physical Therapy, we are not only qualified to treat this condition, but are compassionate Doctors of Physical Therapy who will work with you one-on-one to make sure you return to the active youthful you! Call our office today at 303-805-5156 to schedule a one-on-one treatment session at our Castle Pines or Cherry Creek, CO location.